Bio-fermented tumeric I love it! I love this product. I have been taking it a few months now, purchasing off Amazon. I have now decided to buy direct, and take advantage of the subscribe and save, and reward scheme, which as I am using one bottle every month is worth doing. I have a number of health issues, I have found this products helps my stomach, digestives issues and chronic pain. I am not saying that I am cured or even feel significantly better, but I have noticed a difference, enough differnce to carry on, which I believe is cumlative as well. What I have noticed is that if I don't take it, and maybe miss it on one or a few days, I feel worse for not taking it. So I take that as positive, that on some level it is helping. I also have difficulty swallowing tablets, so this liquid form is a great option. I personally prefer the berry taste to the pineapple, but obviously that is personal preference. I have been taking only 15mls a day, but now may consider increasing to more. I am very sensitive to products, and tried similar, and it didn't suit me, but this seems to work well so far. I would definitely recommend. How do you take your DAILY TURMERIC? FACT - Turmeric is notoriously difficult for our bodies to absorb! Traditional Turmeric Capsules will add black pepper to enhance the bio-availability of turmeric (in simple terms -> black pepper helps your body absorb more turmeric). But even with black pepper the body still has to do a lot of work to break down the Turmeric and make it available. But Liquid Turmeric changes everything: Due to the fermentation process it's already soluble and ready to absorb the MOMENT you ingest it. 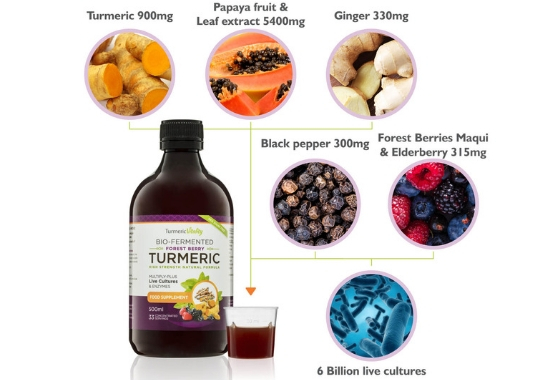 What makes our Liquid Turmeric so Great? It's High Strength! One 15ml shot is equivalent to two standard capsules/ pills/tablets. Plus its delicious! It contains 6 billion Multistrain Live Cultures: A single shot has 8 diverse strains of live cultures commonly found in a healthy digestive tract! Digestive enzymes from Papaya extract: The extracted papaya digestive enzymes means the liquid also gives your digestion a large boost, helping your entire body function better. 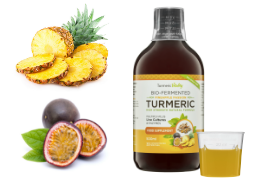 It's got more than just Turmeric in it: Our enhanced combination formula contains Turmeric (900mg), Ginger (330mg), Black Pepper (300mg) and finally Papaya Extract (5400mg). It's delicious: Seriously. Even though its 99% sugar-free the natural fruit flavour is Amazing! During our secret fermentation process, all the good bacteria convert the natural fruit sugars into lactic acid while preserving the rich fruit flavours. We only ask you don't drink the whole bottle in a single day. 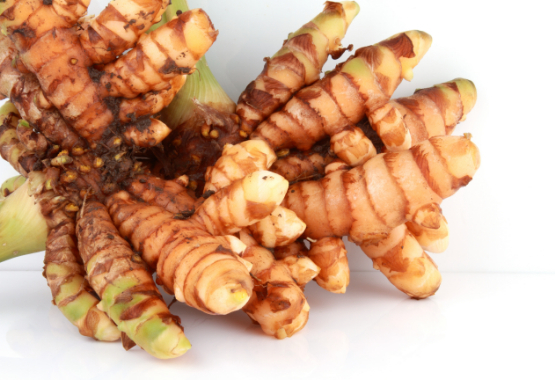 What have others been saying about Bio-fermented Turmeric? 5 Things to know before taking Turmeric. 1. How much to take: The most common amount of turmeric recommended is 1 teaspoon full. This is what most health and nutrition experts advise and is also in line with the University of Maryland Medical Research Center's safe recommendation of 1-3g per day. 2. 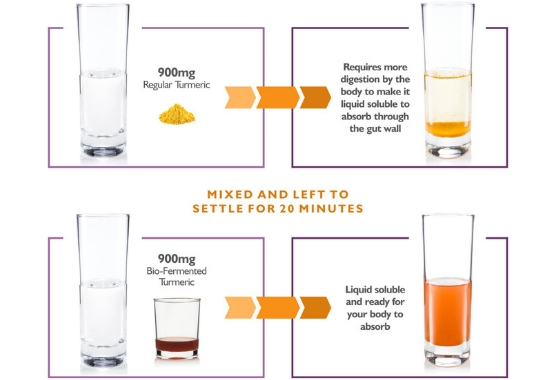 How often to take Turmeric: Curcumin the active compound in turmeric stays in your system for approximately 6-8 hours so it's important to split your daily dose throughout the day. Morning and evening work best. 3. Black pepper: Turmeric needs to be consumed with black pepper as it is not easily absorbed by your body. Curcumin is quickly metabolised and excreted by the liver before it has a chance to be absorbed and made available for your body to use. Piperine, a natural compound within black pepper helps to increase the absorption and bio-availability of curcumin by up to 2000%. 4. Consumed with Fat: The active compounds in turmeric are fat soluble so it's important that turmeric is taken with food. Fat soluble nutrients bind to fat before they can be absorbed through your digestive lining. Most meals are fine but taking turmeric with something very low in fat like a banana would not be effective. 5. 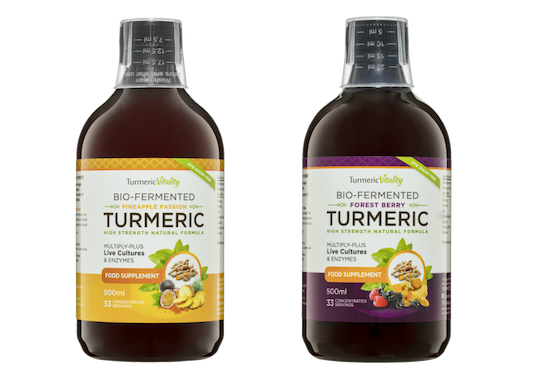 Make sure your turmeric is high quality and pure: As turmeric has increased in popularity it is now in high demand and there are a lot of low-quality supplements that are not tested for purity and contain additives to speed up production.